The squabble over who succeeds the late Paramount chief of Buea, H.R.H., Samuel Moka Lifafa Endeley has been put to rest. 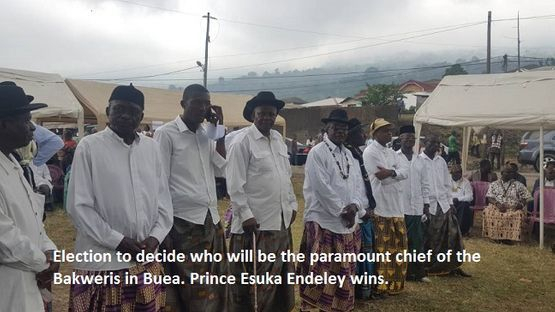 After series of consultation talks between administrative authorities and the Buea Kingmakers, Prince Robert Esuka Endeley was on Monday February 5, 2018 elected to mount the traditional stool that has been empty years after Chief Endeley joint his ancestors. Prince Robert Esuka Endeley, now Paramount Chief elect, got 12 out of 15 votes. 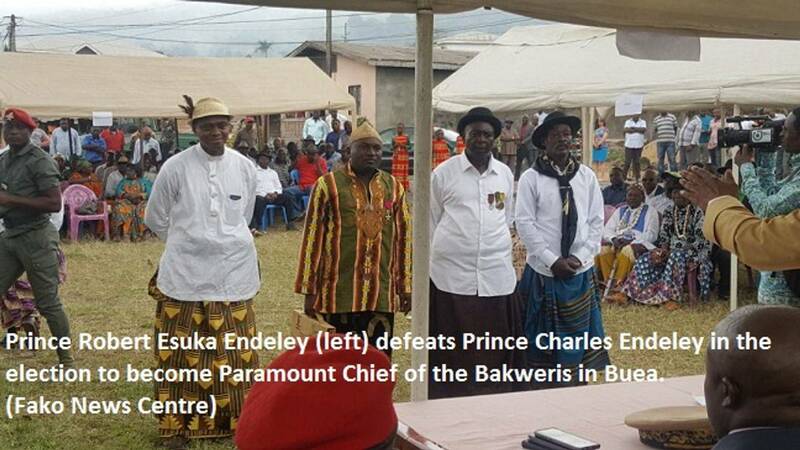 The royal family had earlier thrown their weight behind Prince Esuka to be the next Paramount Chief of Buea but the move was petitioned by the camp of his cousin and son to the late Paramount Chief, Prince Charles Endeley. While playing his role as the administrative authority, the Senior Divisional Officer (SDO) for Fako Division, Engamba Emmanuel Ledoux organised consultative talks involving members of the royal family and the family heads of Buea. Their first meeting that took place last year ended with the SDO advising the royal family to concert and present just one candidate. During the recent consultative talks that took place on February 5, 2018, Prince Charles Endeley still stood up to contest for the royal stool. The kingmakers then requested that the SDO should give them some time to concert amongst themselves before electing the candidate of their choice. While 13 of the kingmakers settled on Prince Esuka Endeley as the next Paramount Chief, three others declared that they should go back to drawing board to initiate the whole process. This meant they should begin from the identification of the families that makeup the chiefdom and selecting the family heads before proceeding to electing the Paramount Chief. However, since majority carries the vote, the SDO proceeded to announcing that Prince Esuka Endeley was the Paramount Chief elect. Being a First Class Chief, the next step is for the Prime Ministerial order setting that date for his coronation after the SDO must have supplied him with reports from the meeting. Born in 1975, Prince Robert Esuka Endeley is the son of the First Premiere of the former British Southern Cameroons, E.M.L. Endeley. He is married and a father of three. He holds a BSc. in Geology, MSc. in Geology, MSc. in Computer Engineering and presently into PhD. Prince Esuka Endeley is taking over the royal stool of his uncle, Chief Justice S.M.L. Endeley who joined his ancestors in the early hours of Thursday July 7, 2015. It is the same way the Late Chief ascended to the throne in 1990 by succeeding his late uncle, Gervasius Mbella Endeley who died in 1982.